Dauntless is Phoenix Lab’s freshman title and is currently in open beta. Dauntless is a free-to-play co-op action RPG. Unlike many other free-to-play titles on the market, Dauntless doesn’t require you to purchase anything. There’s a store where you’re able to buy from a (currently) rotating list of items, but these items are all cosmetic and aren’t required in any way in order to enjoy or advance your character. Furthermore, Phoenix Labs has stated that they “will be continually adding content and updates” to Dauntless, which includes new expansions, adventures, and, of course, new Behemoths. This may be the first release for the Vancouver-based company, but the founders are no strangers to the game development industry. Phoenix Labs was founded in 2014 by Jesse Houston, Sean Bender, and Robin Mayne. Their talented team consists of former BioWare, Riot Games, Capcom, and Blizzard developers. Across their website, you’ll see quotes such as “We make games because we love them, and believe that people are the ends, not the means.” And, even more promising is how quickly you’re able to get responses from moderators in places like the official Dauntless Reddit and the official Wiki. Now in open beta, Dauntless is proving to be a big hit. While not as complicated or involved as titles like Monster Hunter: World, Dauntless has enough of the same qualities to make an easy comparison — enough of one to draw the attention of die-hard and casual Monster Hunter fans alike. The semi-unique style of play makes it stand out from other co-op and multiplayer titles already on the market. 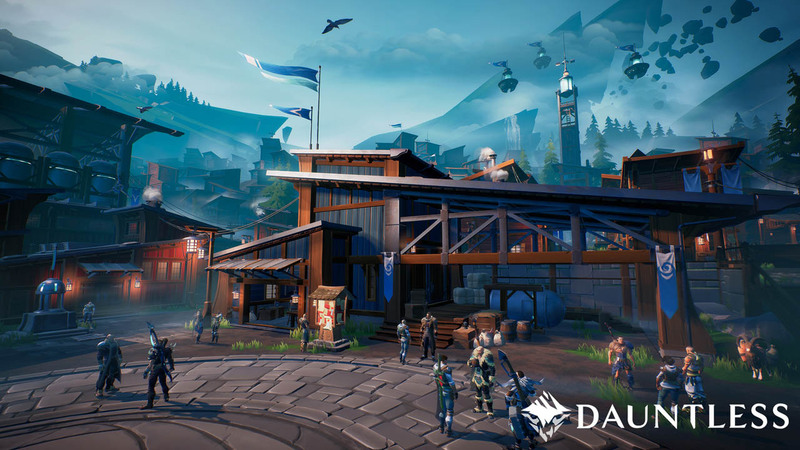 Dauntless had the anticipation factor going for it as the open beta released with queue times as high as five hours on the first day. Don’t worry, though, those queue times have disappeared and the ability to log in and play immediately has taken root. The basic concept of Dauntless is very similar to that of Monster Hunter. You, along with three of your friends, go out on a hunt for various Behemoths. Hunts can also be done solo, but they can often be harder to accomplish without a group of friends. Hunts involve you tracking the Behemoth down on one of the unique maps, and then having your group slay it. Once the Behemoth is slain, you’re rewarded with items needed to upgrade your weapons and armor. During these hunts, you’re also able to collect other materials needed for items, such as various types of potions. In just these hunts, one of the major differences you’ll see between Dauntless and Monster Hunter is that you don’t have any clues to follow to find your Behemoth. Instead, in Dauntless, you just scour the zone until you find what you are looking for. Additionally, the combat system in Dauntless is dissimilar. The jury is still out on which combat style players enjoy more, but it seems that player skill in similar titles may have a lot to do with the combat style that you enjoy. Less experienced players seem to really enjoy the slower and less complicated play style of Dauntless over the more complex style in Monster Hunter. Combat is not complicated. There are two main attacks: light and heavy. There are also special actions that allow you to use simple combos. The combos are all laid out for you right away so you have no need to figure them out or button mash. The simplicity can sometimes be seen as slow and clunky, most often by more veteran players. A majority of your time not spent hunting Behemoths will be spent upgrading your armor and weapons. Armor styles can be mixed and matched in order to achieve the results you want, whether it’s increasing your health, the elemental damage that is done, and so on. Weapons are a bit less customizable. There are currently limited options for what weapons you can choose, and those weapons aren’t able to be changed beyond adding cells to them that you get for leveling up. These cells allow slight customization to weapons and can also be included in armor. There are several different types of weapons, each with their own advantages and disadvantages. Each weapon deals a different type of damage to Behemoths, and it’s always a good idea to have an even balance in groups. Swords, chain blades, hammers, axes, and war pikes are the current options you have. Currently, there are no plans for new weapons while in open beta, although it has been confirmed that there will be new ones in the future. Overall, the game does sometimes have an unfinished feel to it. The graphics even on the highest settings do not impress when compared to similar titles. The graphics are not disappointing, but are seemingly more of an afterthought to the main focus of the game, which is the hunt. Phoenix Labs seems to have put most of their effort into the hunts and Behemoths, letting everything else fall slightly behind. On Twitter, Phoenix Labs shared a link to their Dauntless Roadmap which shows many of the in-progress and future plans they have in store for players. These exciting potential plans could easily make any current concerns irrelevant. Dauntless is a good first release for Phoenix Labs. With a little more time and a greater incorporation of player feedback in making improvements, Dauntless will do well. It could draw in a lot of players who are interested in games like Monster Hunter, but who don’t want to shell out the cash for it, or who are looking for a less complex combat system.